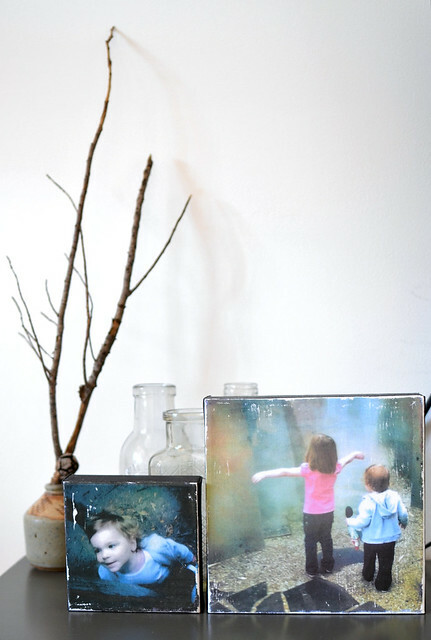 These amazing canvases are the work of my good pal, Heidi, who has recently expanded her photography work to include these photo transfers made from your own photographs. Because the images are actually transferred to the canvas by hand, you end up with slight markings and bits of beautiful texture, making each one truly unique. She created these two for me from a couple of Hipstamatic photos I took with my iPod Touch and I've seen her do some amazing ones with Instagram pics too (she recently did a couple with her 4 year old daughter's artwork that were super cool as well). Heidi is holding a giveaway on her newly launched Facebook page, head over and like her page to be in the running for a 5"x5" artwork of your very own - what would you choose? a photograph or some extra special kid art?